The popularity of private lodge accommodation in privately run, access-restricted wildlife reserves in South Africa has increased exponentially. This is a trend that continues to grow, driven by the demands of local and international tourists and wildlife enthusiasts who opt for luxury accommodation and amenities in an unspoiled, exclusive environment that is never overrun by noisy hordes of eager game spotters. Do you want the best, but find yourself in doubt about the affordability and perceived high prices charged by many such establishments? We are referring to private game lodge owners, some of whom appear to only cater for the overseas tourism market – visitors from afar with foreign currency for whom the finer things in South Africa are available for a song because of the prevailing currency exchange rates. Obviously, the prices charged at a private, 5-star game lodge are considerably higher than those that you’d expect to pay at a modest guest house with only 1 or 2 stars. Realistically, one must compare apples with apples. However, at Fifty Seven Waterberg, our private establishment amidst the wildlife, we strive to keep our accommodation prices as competitive as possible, and not beyond the means of our fellow South African countrymen who appreciate life’s niceties, while still retaining our appeal to visitors from abroad, who are accustomed to the best luxury accommodation and services wherever they go. In the spirit of realism, one cannot only focus on accommodation prices and nothing else. What are you getting for your money? Does what’s on offer represent value for money? What is actually on offer? Whilst we cannot answer on behalf of other wildlife lodges, we’re happy to summarise some of our relevant features. We’re graded as a 5-star game lodge. The luxurious suites in which our guests are accommodated number just five. This means that the lodge and surrounding wildlife reserve offers peace, tranquillity, and untamed nature at its best – no noise pollution, crowds at game sightings, or anything else to disturb the serenity of the African bushveld. Suites are each a minimum of 80 square metres in size – space aplenty and luxury galore, each one featuring glorious views across the expanse of the Waterberg wilderness. 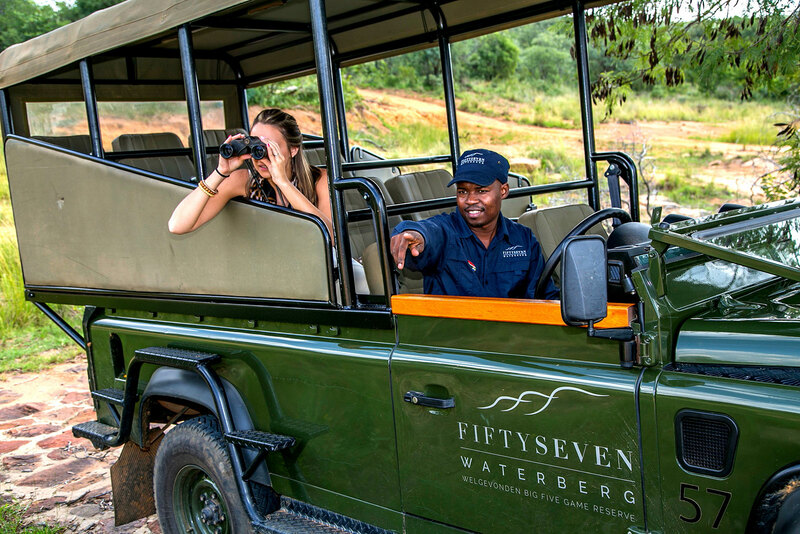 Fifty Seven Waterberg is in the midst of Big 5 territory. Our prices are quoted in ZAR and include full-board accommodation (all meals), selected beverages, and guided safari game drives twice daily (early mornings and late afternoons – the best times to observe the activities of the wildlife). Regardless of where you call “home”, Fifty Seven Waterberg offers you fabulous 5-star luxury, coupled with competitive and inclusively priced accommodation, designed to make the most of your wildlife experience throughout your stay with us.